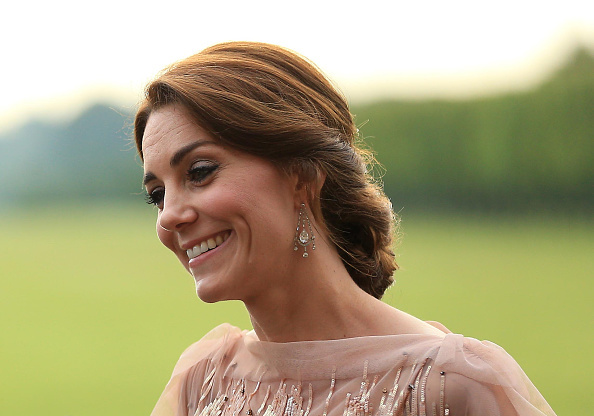 The glittering event was hosted by the Marquess and Marchioness of Cholmondeley in support of Kate’s patronage East Anglia’s Children’s Hospices – with all guests invited as a special thank you for supporting the charity’s fundraising efforts for the Nook appeal. had us wondering wondering which of these two dresses it would actually turn out to be. 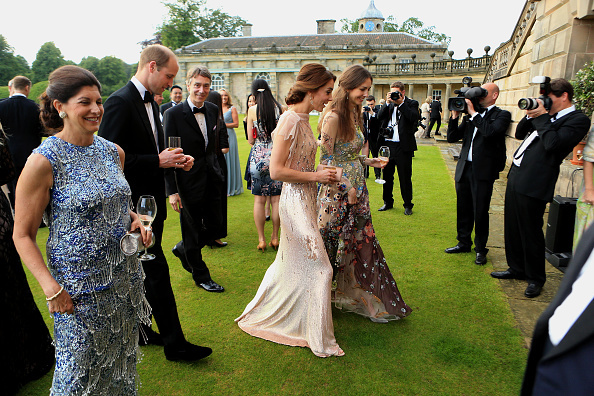 Due to poor communication around Houghton Hall, there was quite the debate as to which gown Kate was wearing (it turns out the Palace mistakenly released stating it was a ‘Jenny Packham gown first worn in LA’ which led to the confusion). Richard Palmer was the only reporter covering the event and had to drive five miles to eventually share photos and info. We want to take a moment and thank Richard for all the hard work tonight, it really is appreciated tonight and at every event. 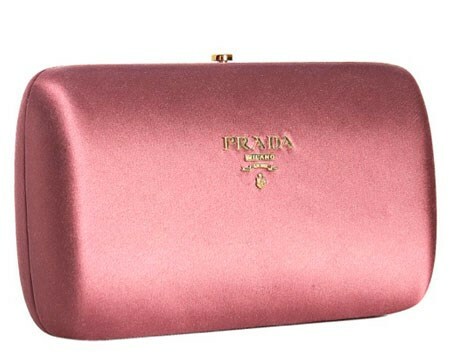 The Dress was from Jenny Packham and was from the Spring/Summer 2011. 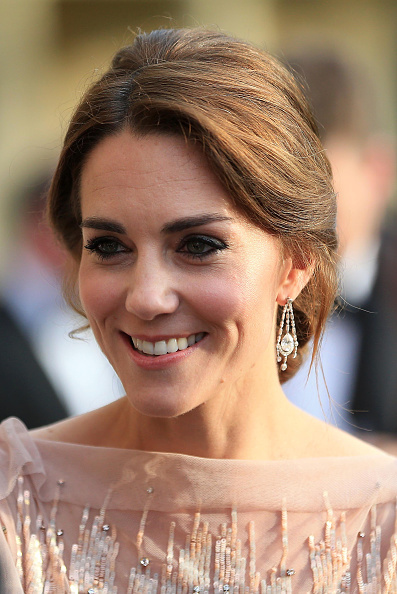 The pieces chosen were the chandelier earrings and bracelet made from Queen Mary’s choker. 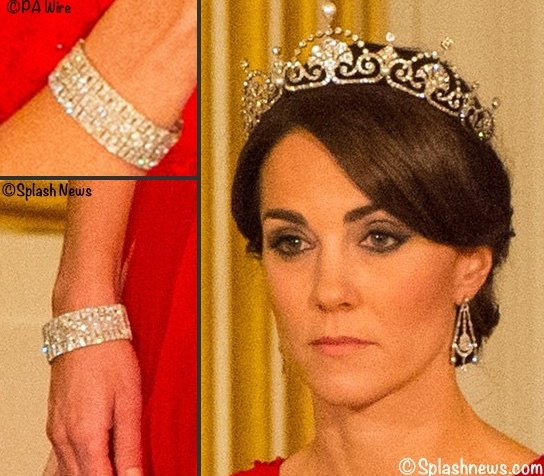 We’ve seen the earrings a few times, but we have only seen the bracelet on Catherine once, and we saw them teamed together for the State Banquet during the Chinese State Visit last year. Attendees were treated to a special five course meal will be served with courses created and cooked by five world renowned chefs: Galton Blackiston, Sat Bains, Claude Bosi, Tom Kerridge and Mark Edwards. The evening also featured a number of exclusive highlights for guests, beginning with a champagne reception featuring musical entertainment by the Jefford Brothers and Sam Aldersey-Williams and magician Archie Manners. The Treehouse Choir performed after dinner followed by a speech from parent Charlotte Markham. Charlotte and her family received care and support from EACH in Ipswich when her son Elliot died at just a few hours old. The dinner was brought to a close with speeches from critically acclaimed author and EACH Ambassador Anthony Horowitz OBE and The Marquess of Cholmondeley. Anthony has been an Ambassador since 2008 and is passionate about the work of EACH. He recently visited the existing hospice in Quidenham to find out more about the plans for the nook and why a new building in Norfolk is so important for care delivery. Built in the 1720s for Great Britain’s first Prime Minister, Sir Robert Walpole, Houghton Hall remains one of England’s finest Palladian houses. A collaboration between the two defining British architects of the age – Colen Campbell and James Gibbs – and with lavish interiors by William Kent, Houghton was built with an eye to reflecting the wealth, taste, and power of its owner. During the eighteenth century, Walpole also amassed one of the greatest collections of European art in Britain, and Houghton became a museum to the collection. The centuries that followed would see the fate of Houghton and its remarkable contents hang in the balance. On Walpole’s death, Houghton passed to his son, and then to his grandson, the 3rd Earl of Orford, who was forced to sell Sir Robert’s picture collection to Catherine the Great of Russia due to debts. At the end of the 18th Century, the house was inherited by the 1st Marquess of Cholmondeley, Sir Robert’s great grandson through his daughter, Mary. The Cholmondeleys only lived at Houghton for about ten years before moving back to their ancestral seat in Cheshire. Houghton was frequently on the market during the next century, and was rented out to a succession of tenants from 1884 to 1916. It was only when the future 5th Marquess of Cholmondeley and his wife, Sybil (nee Sassoon) took on the house just after the First World War, that it was restored to its former glory. In 1979, a typically cash-strapped 17 year old high school student, Galton Blackiston, set up stall at Rye market selling his own range of home-made cakes, biscuits and preserves. The range became known as ‘Galton’s Goodies’ and such was its success during that year ­that Galton abandoned plans to be a professional cricketer, deciding instead on a career as a chef. Within two months of having made this decision, Galton had begun working in the Lake District at the renowned Miller Howe, finally working his way up to the position of Head Chef. With this also followed work experience stints in New York, Canada, South Africa and London. 1987 Tracy and Galton got married and set about finding a suitable location to fulfill their dream of creating a friendly and informal country hotel, where guests would be treated to an amazing experience of relaxed, though professional ambience, with excellent food. A wonderful flint-knapped, farmhouse on the edge of the Morston Marshes caught their eye and today, Morston Hall is one of Britain’s leading country hotels, consistently receiving awards since the AA nominated it as Newcomer of the Year in 1992 and Emily Green as joint winner of the Country Hotel of the year along with Chewton Glen. With a CATEY award, Michelin ‘star’ since 1998, Three AA Red Stars and Three AA Rosettes Morston Hall has been recognised as both a great English hotel and restaurant. Morston Hall was also named in the top 100 restaurants in the UK. Galton has held a Michelin star for 14 years and become UK Craft Guild of Chefs ‘Chef of the year’, East Anglian Chef of the Year and fellow of the craft guild of chefs. Galton has appeared on Anglia Television, Gary Rhodes Food Heros, Market Kitchen, Great British Menu and is a regular on Saturday Kitchen with James Martin (BBC) where he’s always promoting seasonal and Norfolk produce. Galton will always tell people that there is “No finer area” than Norfolk. Bains crossed paths with several influential British chefs over the course of his career. In 1999 Bains was awarded the Roux scholarship. The scholarship led to many opportunities, including working at the 3 Michelin starred, Le Jardin de Sens in the south of France. Bains returned to Nottingham and in 2002, opened Restaurant Sat Bains, winning his first Michelin star a year later. In 2005 he, with his wife Amanda, took over the management of the attached bedrooms and renamed the business, Restaurant Sat Bains with Rooms. The restaurant was awarded its second Michelin Star in 2011. Proud of his Midlands roots, Sat has long championed the use of local suppliers and selected artisan producers, and has showcased this to remarkable effect on the international gastronomic stage, including demonstrating his dishes at congresses in Europe, the US, SE Asia, Japan and Australia. His debut book titled “Too Many Chiefs, Only One Indian” was released to critical acclaim in 2012 and has gone on to win 9 international awards. Originally from Lyon, France, where food is the very essence of its culture; a city without compromise where its people are the toughest food critics. His parents owned a successful restaurant in the city and Claude grew up immersed in a world of produce, seasonality and the disciplines of a professional kitchen. Claude Bosi went straight from catering college to his apprenticeship. His career took him to Paris for the next four years, where he trained under Michel Rostang, Alain Passard and Alain Ducasse. At the age of 25 he moved to England where he became Sous Chef at Overton Grange in rural Shropshire. One year later he became Head Chef and earned himself his first Michelin star shortly after. In 2000, an opportunity arose to purchase a site in the neighbouring market town of Ludlow. This was opened as Hibiscus. Once again he achieved one Michelin star within the first year of opening – and the second shortly after in 2003. Claude moved Hibiscus to its current position in central London, where it continues to be recognized for Claude’s passion for flavours, simplicity and elegance. Originally from the West Country, his early career started in country house hotels and restaurants in Gloucestershire. His first role in a professional kitchen was as a commis chef at Calcot Manor in Tetbury in 1991. He moved around several restaurants as a chef de partie before joining Rhodes in the Square as sous chef under Gary Rhodes in 1999. He spent a further two years as sous chef at Odettes in London. In 2001 he became head chef for the first time, at Bellamy’s Dining Room, and then at Great Fosters in Surrey. He moved back to London to become senior sous chef at Monsieur Max until 2003. Leaving London, he moved to Norwich where he was Head Chef at the one Michelin starred Adlards. Tom and his wife, Beth, set up The Hand and Flowers in 2005 and they were awarded one star in the Michelin Guide in 2006. Since 2012, the pub has held two stars in the guide. Mark Edwards is executive chef of the Michelin-starred Nobu London, the first restaurant to be opened outside the USA by the celebrated Japanese chef Nobuyuki Matsuhisa, and its younger sister Nobu Berkeley Street, which also holds a Michelin star. Edwards also has overall responsibility for all Nobus and Matsuhisa restaurants outside of the US and plays a key role in setting up the kitchens and training staff at all new Nobus that have opened since 1997. Teaming up with Nobu Matsuhisa, Edwards trained in California before opening Nobu London as a Concession in the Metropolitan Hotel on London’s Park Lane in February 1997. Ubon by Nobu opened in Canary Wharf in November 2000, followed by Nobu Berkeley Street in August 2005. Edwards has also co-authored a Nobu cookbook, Nobu West, which was published in 2006. Edwards mans the pass on a daily basis, and his interpretation of Matsuhisa’s modern Japanese fusion cuisine secured Michelin stars for Nobu London in 1998 and Nobu Berkeley in 2006 along with three AA rosettes for Ubon by Nobu.